Initial diffidence is overpowered by the desire for expression. As found in most shy persons, thought processes function at an accelerated pace and the urgency to communicate the same soon brings in confidence. Had he not become a filmmaker, Joywin Fernandes would have surely taken up journalism as a profession. Such is his need to put forth his ideas. His love of films grew with him since he saw his first film as a young boy. The movies were rented by his father as a reward for doing well in school. He remembers fondly, ‘I remember my dad used to take me to a video cassette library every Sunday to hire a movie only if I would get ‘very good’ remark on my maths book.’ The passion for watching films soon transformed into a passion for making films which was an ideal outlet for his creativity. His intention is not just the making of films, but the making of good films. This is something that requires time and he says it takes at least a year to create good cinema. 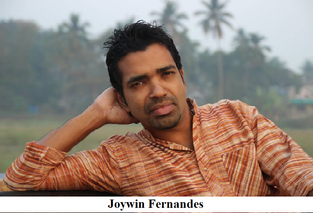 Joywin derives his inspiration from old Hindi film directors. He holds Hrishikesh Mukherjee in high esteem, maintaining that he was among the best of the old timers. He touts Mukherjee’s work as beautiful in in its simplicity, serving the dual purpose of entertaining and sending across a wonderful message. Of the younger lot, Farhan Akhtar has a natural style of making films, which Joywin appreciates. Karan Johar, Imtiaz Ali and Raj Kumar Hirani are good filmmakers who share a common attribute, that is, they make films from the heart. He tries to follow in their footsteps in this aspect.Reminiscing about the Konkani cinema of yesteryears, he says, old Konkani films like Nirmon, Bogllant, Amche Noxib were made beautifully in the old days. Now, though the technical side has improved, it is disheartening to acknowledge the fact that we cannot produce even one per cent of that level of cinema. Talak is the only person who creates good cinema nowadays. This is specifically with regard to 35 mm movies. Apart from 35 mm, there are many filmmakers making small Konkani telefilms. The Goan film connoisseur is heralded for his artistic astuteness. Goan movie buffs are able to delineate good Konkani cinema from low quality movies that lack depth and soul. This is because they compare Konkani movies made for screening with Bollywood films. Another reason for their diminished interest in Konkani films is that they fail to compare the 35 mm Konkani films with the telefilms. He tells of his brush with the highbrows of Konkani drama as a child. When he was young his parents would take him to watch Konkani dramas whereupon he would convince them to let him into the green room to see them. As part of the same industry now he has been able to work with the best of his idols. He directed his favourite director, Roseferns, a wonderful person according to Joywin, in his third movie Chintnam Nuim Sopna. He also got the chance to work with comedian Agostinho, Xavier Gomes, Tony de Ribandar, Ulhas Tari, Dr. Kiran, Kevin D'Mello, Shruti Naik, Nancy, Bushka, Samuel Carvalho, Elvis Mascarenhas and not forgetting his favourite actor, Prince Jacob. Where most parents would be averse to their children entering into the big bad world of movies, Joywin’s father, John, and his mother, Succorina, never stood in his way. This stance by itself proved an encouragement. He has even directed his parents in Friends. He claims their blessings worked the magic of enabling him to win best film award that year at Chota Cinema (IFFI). A small handycam can achieve better results than a fancy high tech camera as long as the movie serves as a vehicle for a good story. The story is evidently the soul of a film. The problem with many filmmakers is that they cannot envision what they would like to portray. Another pitfall is casting. There are times when forty plus actors are made to play college students. He has not faced any major problems in the process of filmmaking. Every film is like a new life to him. He takes up challenges as they come along. He loves to work with different kinds of people as it becomes a means of learning from them. He asserts that filmmaking is relatively easier as compared to taking that same film to the public. Financial constraints appear in the form of local theatres charging high prices to screen the films and expensive publicity in newspapers. Joywin’s ninth and latest film has his favourite actor Prince Jacob displaying his thespian skills. Initially he felt that none of his stories were worth featuring his most admired actor. Finally with MMS... A Violent Story of Love he managed to rope in Prince Jacob and it turned out to be an amazing experience.